Orton makes cones from cone 022 up to cone 42. 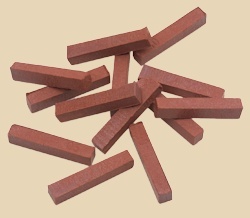 During firing, cones soften and melt as they are heated, and gravity causes them to bend. This bending indicates that the cone and the ware on that shelf have received a specific amount of heat, matching the formulated melting point of the materials in the cone. It usually takes 15 to 22 minutes for cones to bend fully once they begin melting. Cone numbers originally started at 1 and went to 20. Each higher cone number requires more heat (a higher temperature) to bend. As demand for cones grew, both lower and higher cones were developed. A zero was added in front of the number for cones maturing at lower temperatures, below the original cone 1. Thus cone 01 needs less heat than cone 1, and cone 020 needs less than cone 019. It is important not to mix up the lower maturing cones, whose numbers begin with zero, with the higher maturing cones. Cone 6 and cone 06 are not the same thing! When using cones in the Dawson Kiln-Sitter to control your kiln, place the cone for your desired target temperature between the claws of the cone holder inside your kiln. When the cone melts, the sensing rod will trip the plunger to shut off the kiln's power. When using witness cones in your kiln, place cones on each shelf. It's common and recommended to use 3 cones on each shelf: one cone is the actual target temperature, one cone is one increment higher, and one lower. For a cone 04 firing, the trio of cones would be one each of 03-04-05. This combination will indicate how accurately your kiln reached the target temperature on each shelf of your kiln. Regularly using witness cones gives you the true measure of how accurately your kiln fires to the desired temperature. Leadfree glazes require consistent firings to the proper temperature to achieve proper clay/glaze fit and to meet food safety standards. Witness cones are a must for porcelain doll firings, too. Porcelain is unforgiving, and there is no margin for error. The machine that Orton used to separate the cones was extremely old and finally broke down, so Orton has decided not to replace the machine. You will find the cones attached together and they will need to be split apart. It is very easy - use a butter knife, screw driver, or anything with a flat tip as a wedge between the two cones and tap it with something like a heavy spoon. The two should break apart easily. We will have a video soon showing how to deal with the extra step that is needed before using the cones. For more information about Orton cones, please visit www.ortonceramic.com. 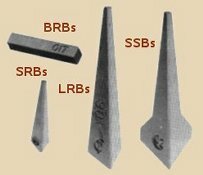 Orton bars were specially designed to function in the Dawson Kiln-Sitter. They yield the same result as Junior Cones centered in the Kiln Sitter. The uniform shape makes consistent placement easy without affecting the firing. Click the down arrow for more temperature options. 50 per box. Price discount available for 12 or more of the same item number at $8.78 each. Discount will not show in shopping cart but will be applied to your order when taken off the website. The original Orton metric cones. Widely used as witness cones on kiln shelves to visually monitor firing progress and heatwork throughout the kiln. 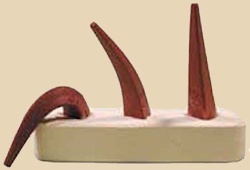 Large cones need to be supported by a cone plaque, a clay pat or a wire cone holder. Uniform mounting height and angle are very important. Click the down arrow for more temperature options. 50 per box. Price discount available for 12 or more of the same LRB item number at $10.05 each. Discount will not show in shopping cart but will be applied to your order when taken off the website. *These items are not stocked but can be special ordered. Small "Junior" Cones are commonly used in the Dawson Kiln-Sitter. The tapered shape allows some flexibility in adjusting the shutoff point by placing the thinner or thicker portion of the cone under the sensing rod. Junior Cones can also be used on the kiln shelf as mini witness cones when space is limited. Junior Cones deform at slightly higher temperatures than Self-Supporting or Large cones rated for the same temperature.50 cones per box. Price discount available for 12 or more of the same item number at $7.31 each. Discount will not show in shopping cart but will be applied to your order when taken off the website. Self-supporting "witness" cones are the most accurate and easiest to use cones available. Cone holders or plaques are not needed. Many glaze and kiln manufacturers recommend use of witness cones to achieve best firing results. 25 cones per box. Price discount available for 12 or more of the same item number at $7.20 each. Discount will not show in shopping cart but will be applied to your order when taken off the website.